The V and A Museum in London commissioned artist Mat Collishaw to animate the Museum's architecture with a work of haunting beauty. A monumental zoetrope (the device first designed in 1834 to project a rapid succession of images to stimulate motion) is the result. 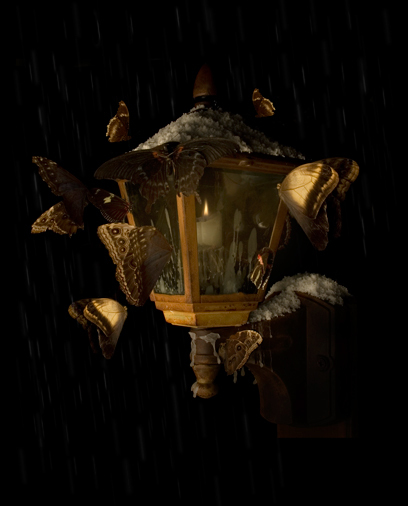 Magic Lantern transforms the Museum's edifice into a beacon of light, brought to life by fluttering moths visible from duck each evening. The commission is accompanied by a small replica zoetrope which will animate the John Nadejski Garden during the day. Mat Collishaw, Midnight Icarus, 2010. Courtesy of Mat Collishaw.